It is a simple fact that some dogs do eat poo! It's not a nice habit and one that needs to be discouraged, but why do they do it and how can it be discouraged or stopped? Is it all to do with poor diet or are there other explanations? It's not unusual in nature! We've all seen flies and beetles gather around faeces (the dung beetle is a case in point) and there's no doubt that there are nutrients particularly in herbivore's droppings. Pigs will eat the faeces of herbivores, and cattle in the US have been fed chicken litter as it contains a cheap source of protein. Rabbits and related species will digest for a second time soft faecal pellets because they do not have a complex digestive system and this allows them to extract further nutrition. Many animal species eat the faeces of their mother or others in the herd, providing bacteria which allow them to properly digest vegetation. Without the bacteria they would not be able to digest plants. It's not unusual, but it's not normal! Chronic health problems such as Pancreatitis and Exocrine Pancreatic Insufficiency (EPI) cause a deficiency in pancreatic enzymes, which are needed in the digestive process - and not surprisingly these dogs can develop the habit of eating faeces. The pancreas produces the enzymes to help digest food especially plant material and carbohydrates. Adding enzymes to these dogs diets will help in digestion of the food and help recurrences of pancreatitis, thus reducing or curing the problem. Dogs suffering from medical problems that cause malabsorption of food, such as inflammatory bowel disease or some infections can develop a habit of coprophagia. This is why it is always getting veterinary advice if this habit begins suddenly, continues or gets worse. Most of these are not proven by experimentation - so please do not take them as genuine reasons. 1) There is anecdotal evidence that some dogs, particularly in kennels or stressful conditions may become anxious and eat faeces. 2) Overfeeding, particularly on a high fat diet has been suggested as a cause. 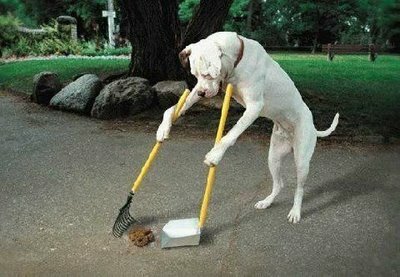 4) A dog may see its owner picking up poo and learn to do it as well! 5) A dog may see other dogs doing it and learn from them. 6) There have been reports of a submissive dog consuming the faeces of one or more dominant dogs in the same household. 7) Something about eating the faeces itself reinforces the behaviour. Things such as taste may be a factor in this. It's simply appealing to the dog to eat the faeces..... so it does so. 1) Clear up your dog's poo immediately! 2) If you have a cat, don't let your dog have access to it! 3) Improve your dog's diet. A high quality food contains less indigestible material and therefore will ensure your dog has all the nutrients it needs. There is also less likelihood of faeces containing carryover of nutrients. 4) Make sure your dog is not bored - exercise them and give them toys to distract. Bored dogs can pick up all manner of bad habits! 5) If all else fails there are various veterinary and non-veterinary products which can either be added to the dog's food or directly on the poo to discourage the habit. But this may not be as effective as simply removing the temptation in the first place! 6) Punishment hardly ever works! 8) Positive reinforcement is effective. Distract your dog in the act with a suitable call (leave it, come, sit etc) and then pick up the faeces. Dogs can pick up parasites from eating the faecal matter of infected animals - hookworms, tapeworms and roundworms are common and can cause serious health problems!